Contrary to belief, Arizona Javelinas (pronounced Have-a-LEEN-uhz) are not pigs. That was something that I learned when researching them. Funny though, they smell like pigs! Maybe that is how they got their name; I don't know. Don't be surprised if you smell one before you see one! They do have an odor about them! They are not considered a rodent, as some may believe. They are actually more closely related to the European Bore, according to Arizona's Department of Game and Fish. Arizona Javelinas are native wild animals found in Arizona as well as other parts of the world. These wild like pigs can also be seen in the Chihuahuan and Sonoran Deserts of southwestern Texas and New Mexico and are also known to live in Central America and northern Argentina and are primarily herbivores. According to the Arizona Department of Game and Fish, they can be found in much of the central and southern regions of Arizona, including the outskirts of the Phoenix area, including most of Tucson. They have been known to be spotted as far north north in the state as Flagstaff. Some other facts are: they are more slender than your typical pig on a farm, weighing between 40-60 pounds. Javelinas can actually run pretty fast, having just three toes on each hind foot! They have been known to run as fast as 35 miles per hour, if you can believe it. They prefer living in the brushy desert areas as well as rocky canyons and wash areas containing dense vegetation. Beware if you have Prickly Pears or Agaves! Arizona Javelinas favorite food just happens to be Prickly Pears and Agaves! They AZ javelinas are also known as Collared Peccaries, travel in small groups and will,in addition to eating Agaves and Prickly Pears, eat other food items such as insects, roots, fruits, reptiles, and worms. In the northern range, Collared Peccaries eat more herbivorous foods, such as roots, bulbs, beans, nuts, berries, grass and cacti. Despite all this supplementary diet, the main dietary components of this species are agaves and prickly pears. Just looking at these pig-like animals, you can tell that their fur is coarse and bristly, which is characteristic of them. The color of their fur is black and gray. Located on their rump is a scent gland, which, when excited, will give off a very distinct musky smell. When frightened, the hairs on their neck and back become very bristly when they give off their infamous smell. The Collared Peccaries like to mark their territory by rubbing these mentioned dorsal scent glands against such things as the shrubbery or trees in their areas. My mother who lives in Gold Canyon, sees them quite frequently in the retirement community of Mountainbrook Village where she lives. I have been lucky enough to see a family of about four of them one day while I was over at her house. 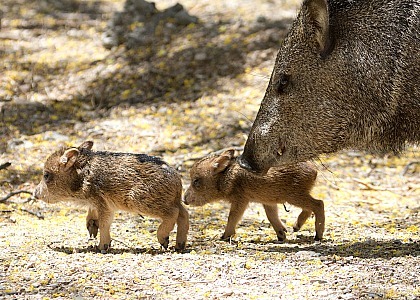 My mother has seen them on countless occasions only because her house is backed up against the mountain and there is also a wash area which certainly attracts the javelinas. I was probably no more than 20 feet away from them which was pretty exciting, to say the least. The little babies are so adorable as you will see below! Known for their long snout and great sense of smell, Arizona Javelinas are not known for their vision senses and as far as their hearing in concerned, I have heard that their hearing is fair to good, in range. Javelina are known as herd animals, averaging 8 to 9 animals. Javelina territories are set up using their droppings and dorsal scent gland to mark their desired areas. According to Arizona Game and Fish, they are known to be aggressive in nature if intruding javelina threaten their territory. Their territory size will vary with relation to the productivity of the javelina habitat, averaging about 750 acres. They prefer staying together though, as a way of defense, to protect their territory and are also more commonly seen during night time hours as well as when cooler weather arrives. Arizona Javelinas don't breed at any specific time of the year. However, breeding increases during rainy seasons. They will, though, breed all year long and have between two to four babies. More likely though, they will usually produce two babies. Here in Arizona, Javelinas are known to mate in the Spring, around February and March. The gestation period is 145 days, which means most babies are born during the Summer months. The little babies will typically stay with their mother for approximately two to three months. One of the reasons that they breed as frequently as they do may be due to the fact that Javelinas have a pretty high mortality rate. They, however, generally live up to about ten years in the wild. I also learned that one of their predators is not the rattlesnake, but rather bobcats and coyotes, along with mountain lions. 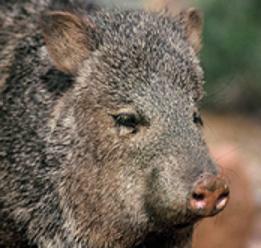 While they are not known to routinely attack people, Javelinas have, on occasion, done so. When they have attacked people, they are generally in large groups, or when the mother feels that her young are in harms way. If you are like me, you may be tempted to feed them. However, it is not recommended that you do so as they will become accustomed to your feeding, and will likely show up at your house, or wherever you are feeding them, AND in large numbers! I have heard of people feeding them in their neighborhoods, only to find that they not only later showed up expecting more food, but also doing damage to their plants and other vegetation so, as already stated, feeding them is not recommended like any other wild animal. They have also been known to dig up holes in homeowners yards, and even knock over garbage cans and pretty much set up camp in their yard! Funny to some perhaps, but very real. Click here if you would like to learn more about AZ javelinas.